Having installed the WP-Archives plugin (learn how-to here) a couple of days ago and pretty astounded with what it did for our Archives page, I went scouting for a similar plugin that could generate a sitemap for our website. From the many available, I found the plugin, Dagon Design Sitemap Generator, most remarkable and had it installed pronto yesterday! But later found out that this version offered by WordPress Plugin Directory was ver. 3.15, an older version. 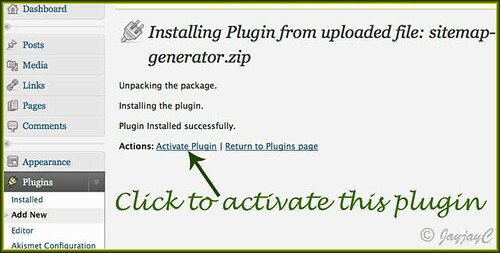 Preferring to have the latest version 3.17 instead, I returned to its plugin source page at Sitemap Generator Plugin for WordPress – Dagon Design to get an idea on how to upgrade and was most delighted to find explicit instructions on installation and upgrading. And, promptly carried out the whole process with more confidence this time round. We’d like to take this opportunity to pen our heartfelt thanks and appreciation to Dagon Design for this awesome plugin! God bless you for your generosity! You’ve made us so very happy, knowing that our sitemap, newly created with your plugin will be such an asset, not only to us but to our readers/visitors alike. Thank you again! show comment counts and/or post dates, and much more. 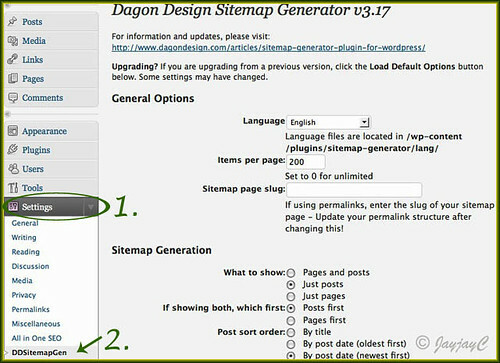 Go to Dagon Design’s plugin webpage and download the latest release of Dagon Design Sitemap Generator – version 3.17. Remember where the .zip folder is located in your computer for later use. The Install Plugins window opens. 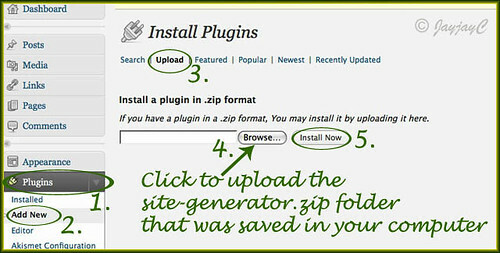 Click the Upload button, followed by the Browse button, to upload the site-generator.zip folder that you had downloaded to your computer at step 1 above. Then, click the Install Now button. 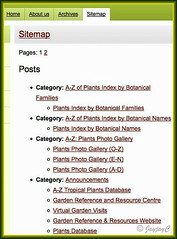 Then, click Publish and view your newly created Sitemap. Beautifully displayed and packed with the whole collection of your site’s posts, yes? Well, you still have available options to how you want them presented. Just go back to your Site admin panel > Settings > DDSitemapGen, and configure your selections. If necessary, refer back to Dagon Design’s plugin page (get link at step 1 above) for more direction. Finally, click Update options and you’re done! Hope the above tutorial had helped you to create your dream sitemap for your blog/website. Keep smiling and enjoy the new look! I am….with ours! As a blog reader, I am readily on the search for information that are both appealing and helpful to read and I must say your blog passed with high honors. Many thanks for the wonderful content you have shared! Will be coming back soon! Thanks, wordpress designer! We appreciate your kind thoughts! Nice plug in. But do you know how to create another working page from the sitemap generated by this plugin? Because when I click for next on my sitemap, it’s error 404! Nimotheone, you have already rectified the problem, right? All look fine to me! This is a great plugin – even if you opt to create your own site map manually for aesthetic purposes it is still a great tool to see what is on your site as you are building it.and creates an instant view of the sites’ hierarchy. But what I really wanted to comment on was your great instructions. Great plug-in — great article. Thank you so much for your kind comments, LAWolfe. You’ve put a smile on our faces! I used it for my online store and I truly love it. Thank you Ms Jacquiline for the sharing.